To stay up to date on upcoming VIE events, sign up for the local newsletter! It’s time for our next breakfast session!Our speaker for this months theme FAILURE will be Ali Mahlodji, founder of WHATCHADO. Ali will give us a look behind the scenes of whatchado. Unser Sponsor Julius Meinl Kaffee hat uns bereits zum zweiten Mal Inspresso Kapseln, sowie Tee und Marmelade zur Verfügung gestellt und dafür gesorgt, die kreativen Köpfe Wien’s am Morgen in Schwung zu bringen und zu inspirieren. We’re getting back to our roots this month as we talk about HERITAGE. 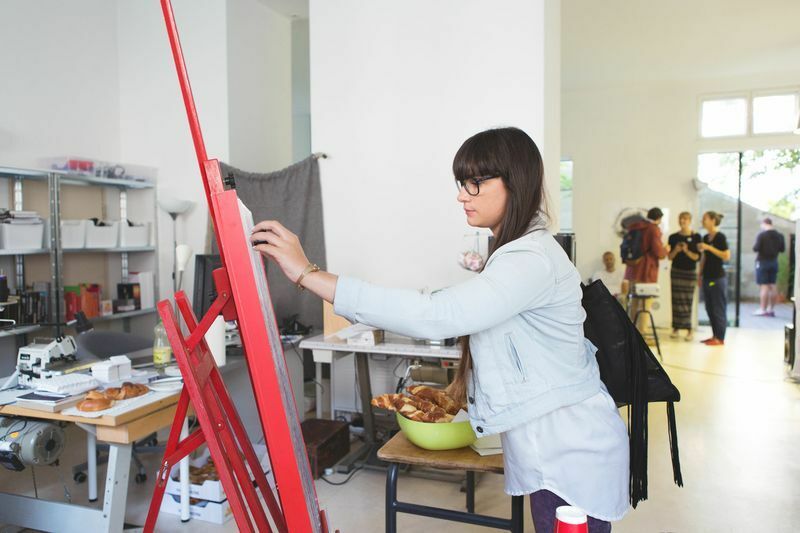 In order to take you back to where everything began, we invited the art historian and publicist Stefanie Jovanovic-Kruspel who works in one of the most historic place in Vienna, at the Natural History Museum. There she is working as curator for the (art) historical reappraisal of collections. Coming soon on the occasion of the 125th anniversary her new book on the architecture, design and equipment of the museum is about to appear. Issue No. 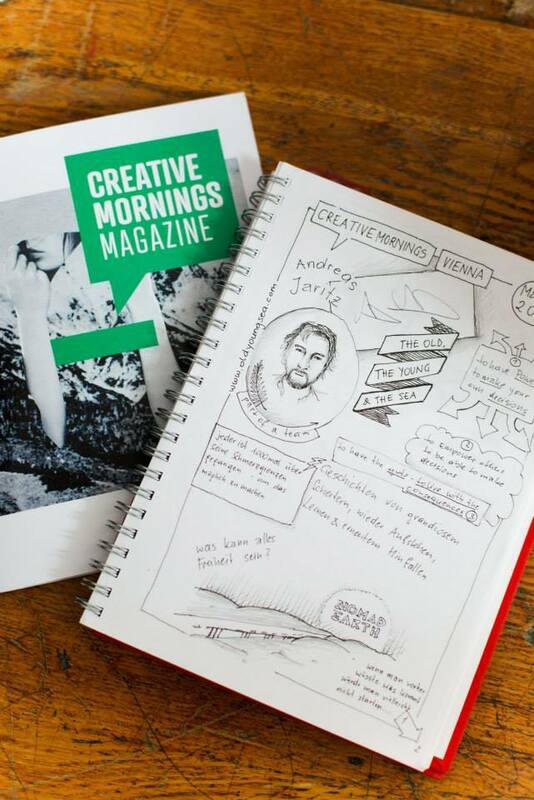 2 of CreativeMornings Vienna’s own magazine, featuring an interview and background information on Stefan Rössler, co-founder and designer at Simplease, as well as the monthly essay by paroli.at (this time Mara Simperler), accompanied by Stefanie Hilgarth’s illustration. Also featured: Interactive agency WILD, Gregor Hofbauer, creative director at Strukt and Vienna-based type- and designstudio Typejockeys. 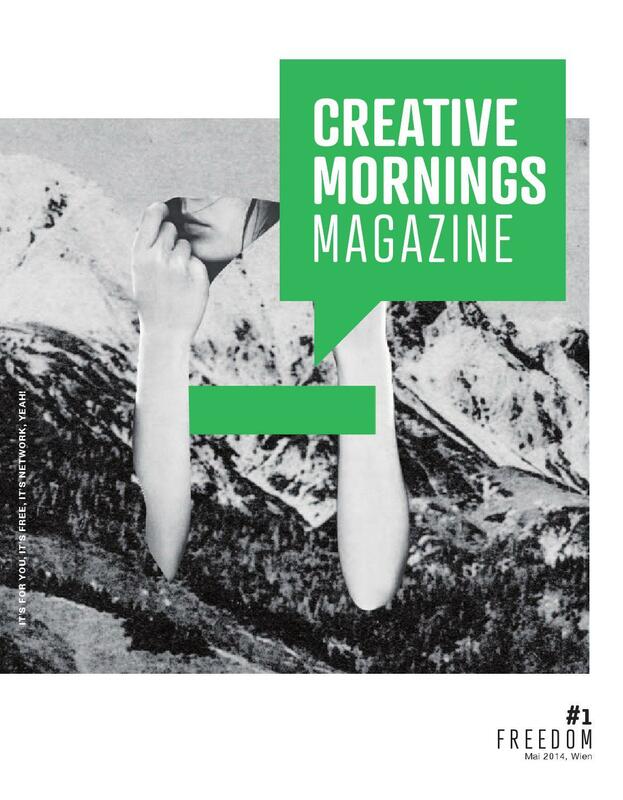 Zur Premiere von Creative Mornings in Wien haben wir uns etwas ganz besonderes überlegt – ein eigenes Magazin zu jeder unserer Veranstaltungen! Ist for you, ist free, ist network! 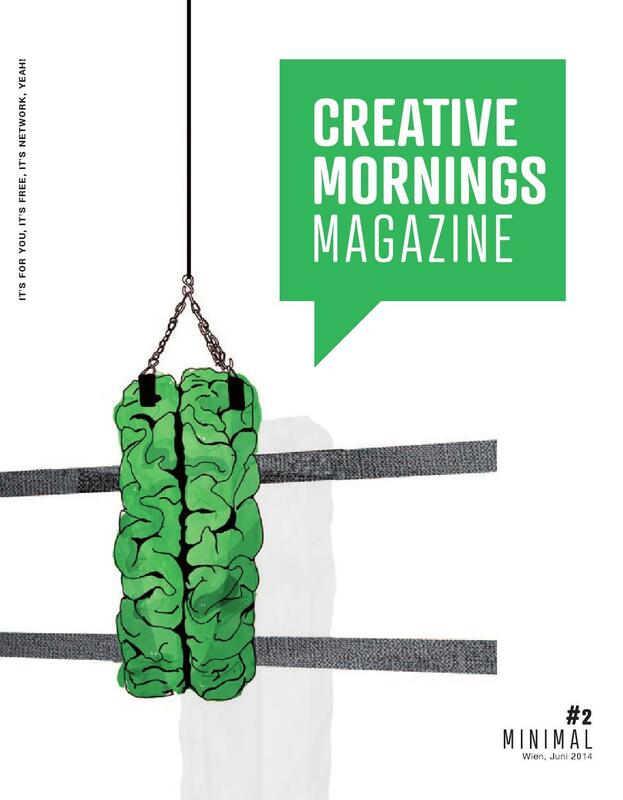 Das Creative Mornings Magazin gibt euch ein kurzes Speaker’s Profil und versorgt euch mit einem Background Interview des Speakers. Das Magazin will – wie die Veranstaltung selbst – vernetzen und inspirieren und stellt deshalb Leute aus Wiens Kreativ Szene vor! 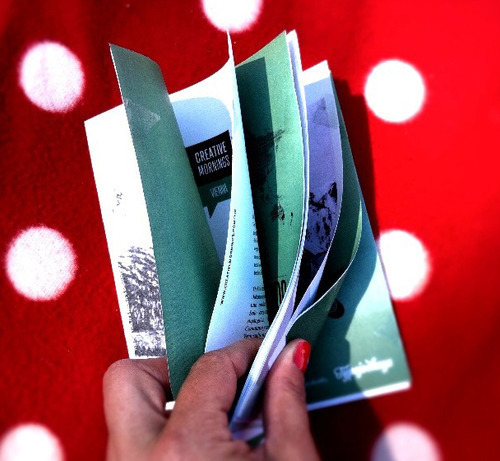 In der ersten Ausgabe: Elke Bauer ( Illustration), Sophie Dolbhoff-Dier (Industrie- und Grafikdesign) das Online Magazin Paroli (Journalismus) und den Musik und Sounddesigner Matthias Müller. Außerdem freuen wir uns über einen typografisch gestalteten Beitrag von den Typejockeys und einen Essay von Paroli. Stefan Rössler studied Information Design at the FH Joanneum and in 2010 founded Simplease together with three colleagues, where he’s since then working as a user interface designer. He is convinced that communication is a key component of our experienced world. 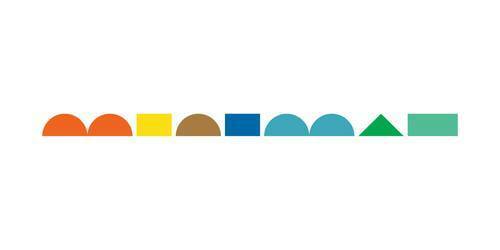 His goal: To improve this world by simple design of communication. Preferably he reaches this through an outstanding design - clear and workable user interfaces, which simply “feel good”. Careful planning, surveys and usability testing should not be neglected here. Since 2010 he is sharing the knowledge and experience that he has collected over the years to students at FH Joanneum (interface design and usability testing), and since 2011 at those of the FH Salzburg (Interface Cultures and Interaction Engineering).He can also to be found regularly at conferences and barcamps. More info about Stefan’s work and Simplease can be found on simplease.at, as well as on blog.simplease.at where you can regularly learn exciting facts about design and web development. 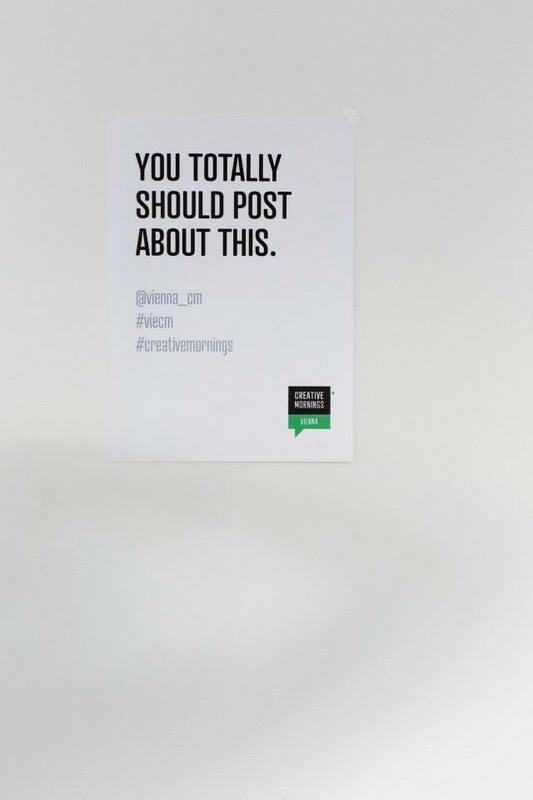 Zur Premiere von CreativeMornings Vienna haben wir uns etwas ganz besonderes überlegt. Etwas, das bisher keine anderes Chaper zu bieten hat – ein Magazin zur Veranstaltung! 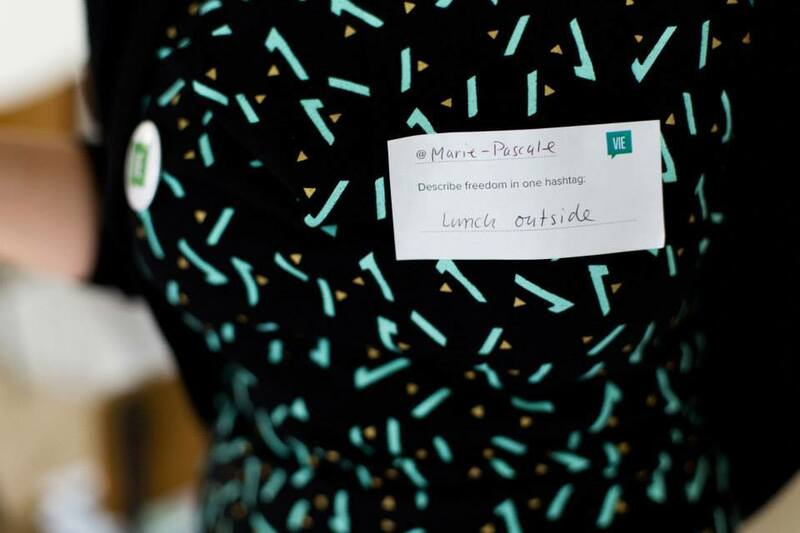 This was our first CreativeMornings Vienna event - a session full of inspiration about this month’s topic FREEDOM with speaker Andreas Jaritz, from The Old, the Young & the Sea. 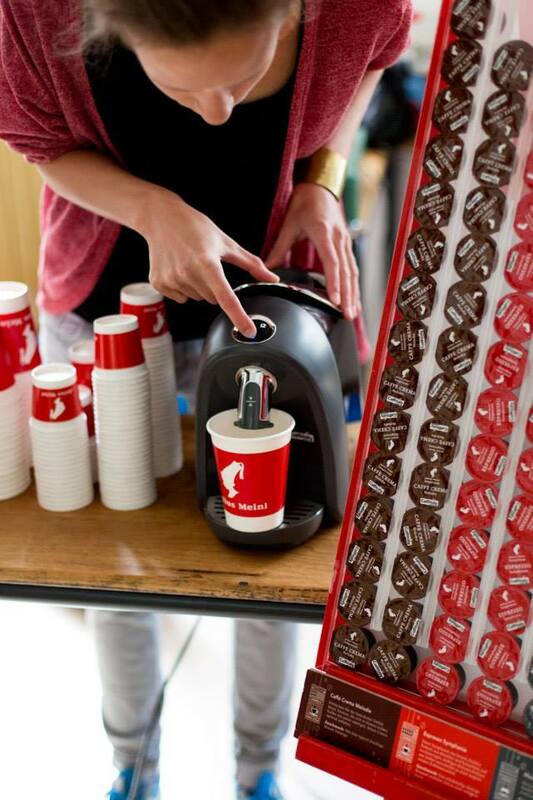 An interesting talk and a tasty breakfast sponsored by Julius Meinl Coffee & Ströck Brot as well as refreshments from LemonAid made the premiere of CreativeMornings Vienna to a magnificent start of this new chapter! Thanks to everyone who was part of this first event - we are looking forward to many more breakfast sessions together with you! For more photos check out our album on our Facebook page. To watch the video of the event click here. 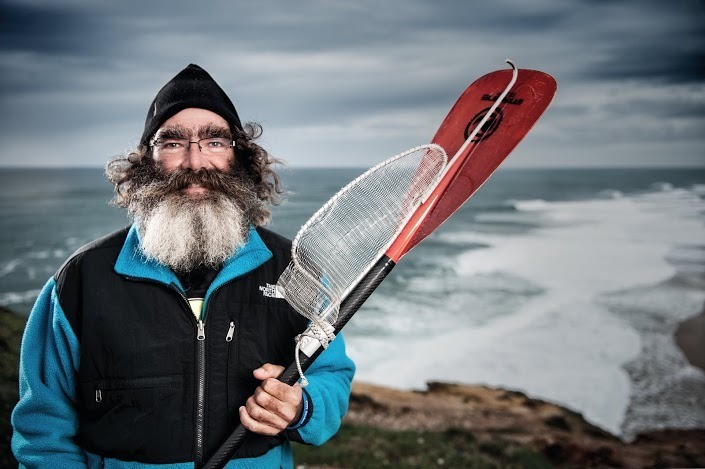 Andreas Jaritz is the producer of the first European surf documentation “The Old, The Young & The Sea”. The idea for this project was already born a couple of years ago, together with his colleague Mario Hainzl, director of the film, after two exchange semesters in the Spanish Galicia as well as Chile. 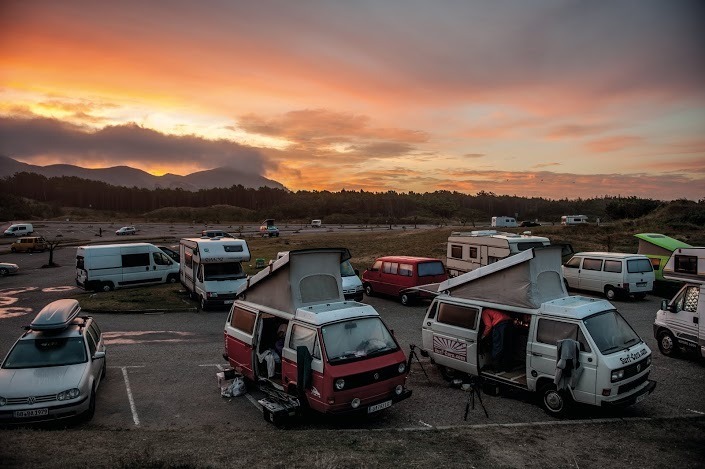 As you don’t do a project of this size on your own, the starting point was when they found their team of filmmakers, photographers and journalists who were ready to go on a 16-week tour in two old VW buses, to discover the heart and soul of Europe’s surf culture. 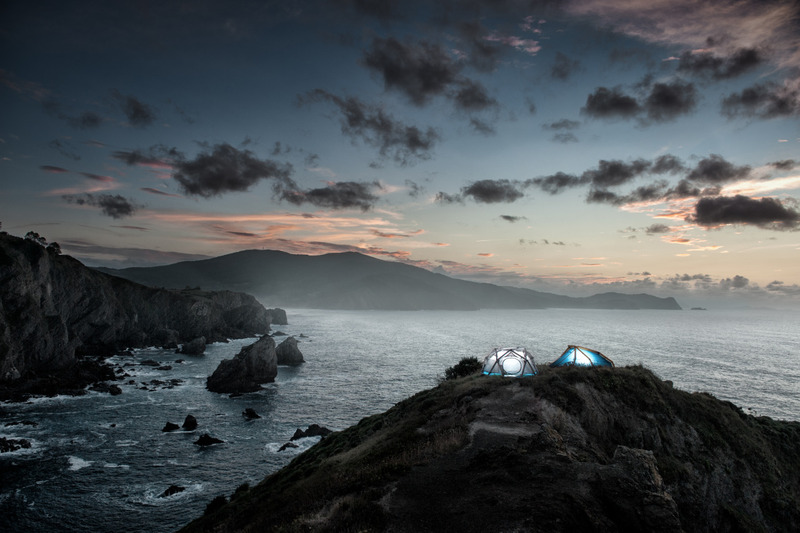 On a camper van trip along the European Atlantic Coast they met surprising acquaintances full of stories about the quest for freedom and self-realization. During the past two years Andreas devoted himself almost exclusively to the project Surf-documentation. 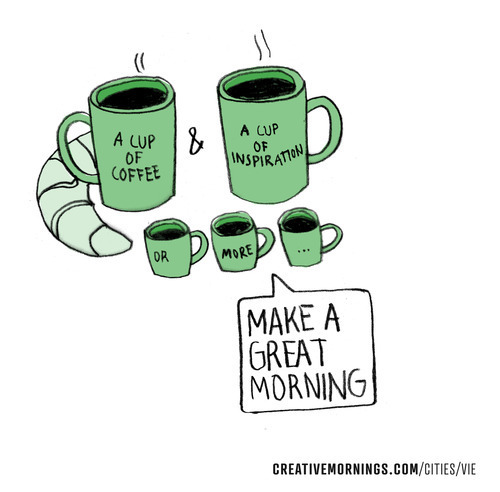 At our first CreativeMornings event you will be able to learn more about his learning, experiences and thoughts on the “quest for freedom and self-realization”. 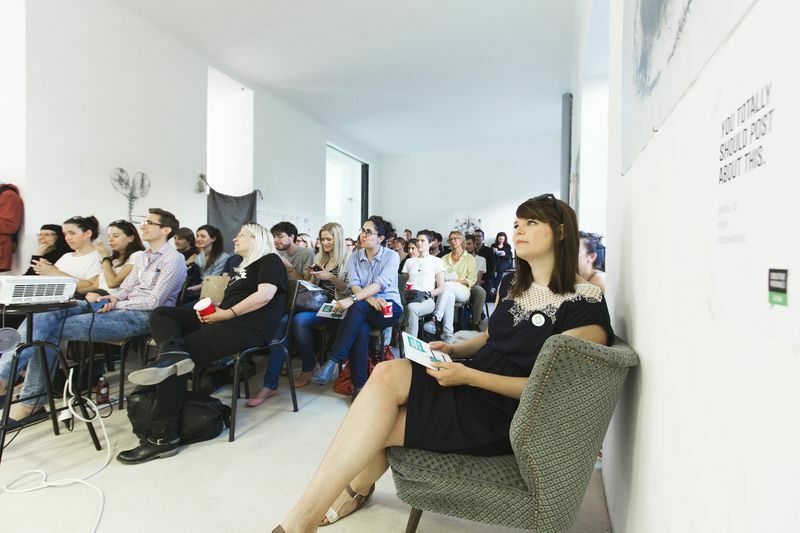 Vienna is going to host its very first CM event in May ! Stay tuned and subscribe to our newsletter to get all the news!